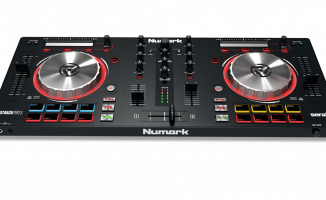 The Numark Mixtrack Pro II updates and streamlines the best-selling Mixtrack Pro, and will be in the stores as of January 2013. 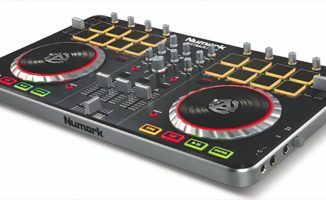 The Numark Mixtrack Pro II was announced today ahead of NAMM 2013, offering an upgrade to the popular Mixtrack Pro, “the world’s best selling DJ controller” according to the company. 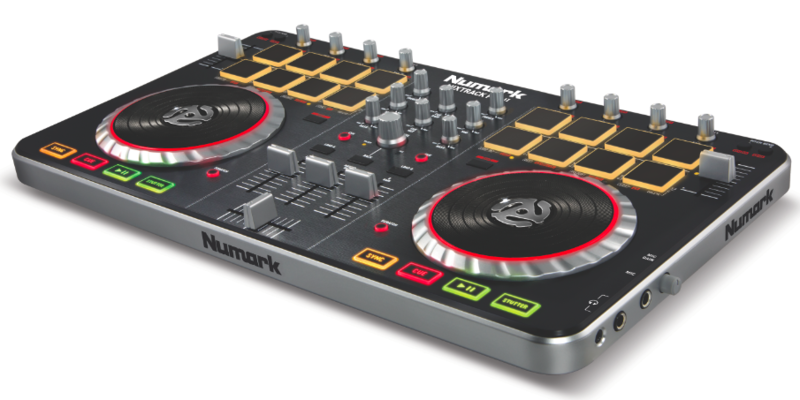 (Update: Read our full Numark Mixtrack Pro 2 review). The design is less clunky and more streamlined, and the platters take a leaf from controllers like the Pioneer WeGO, gaining illumination. The other headline feature is the addition of 16 backlit multifunction drum pads. 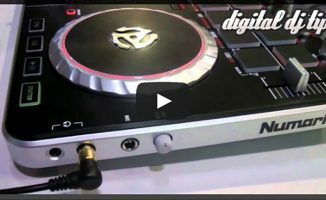 Read on for more, or catch our Numark Mixtrack Pro II video talkthrough here. It ships with Serato DJ Intro in the box, giving a great starter set-up which can easily be upgraded to Serato DJ for an additional fee (we’re assuming that fee will be the standard US$129), in order to unlock further functions of the software. The controller can also be used with other DJ software such as Virtual DJ and Traktor. We’ve long championed the original Mixtrack / Mixtrack Pro as the best budget entry into digital DJing. 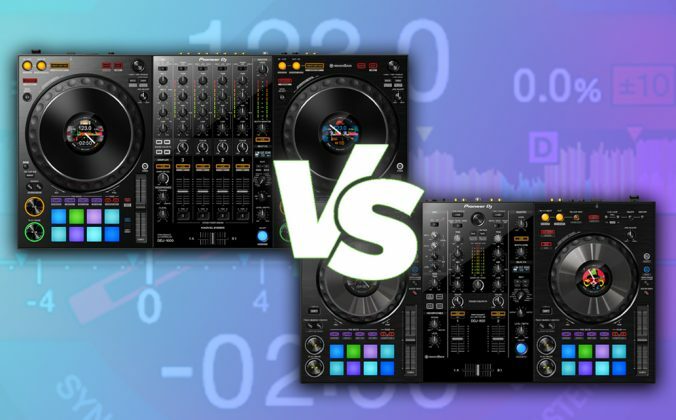 With the addition of Serato DJ Intro to that formula (the best entry level software, in our opinion) last year, it became even more so. This update is designed to cement that position in the market, although at a seemingly higher street price. 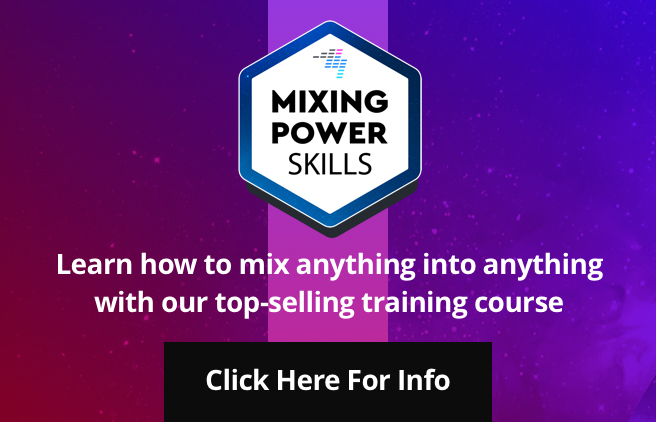 It remains to be seen the actual price that the Mixtrack Pro II hits the streets at, but it needs to remain close to the price of the original if it is to remain the no-brainer budget option. We’re at the NAMM Show this week and will bring you a video and further thoughts when we see it in the flesh. • The controller will hit stores imminently, and has an “estimated street price” of US$299. 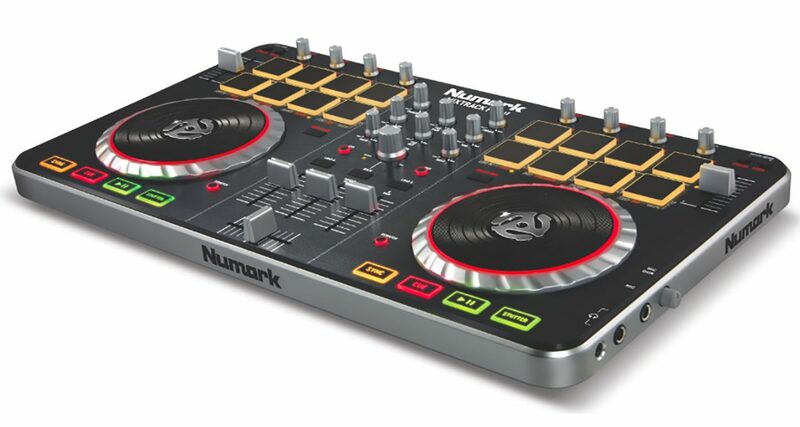 At first glance, do you think this improves on the winning formula Numark hit on with the Mixtrack and Mixtrack Pro? We’d love to hear your thoughts in the comments. Master volume on a slide is such a bad idea. 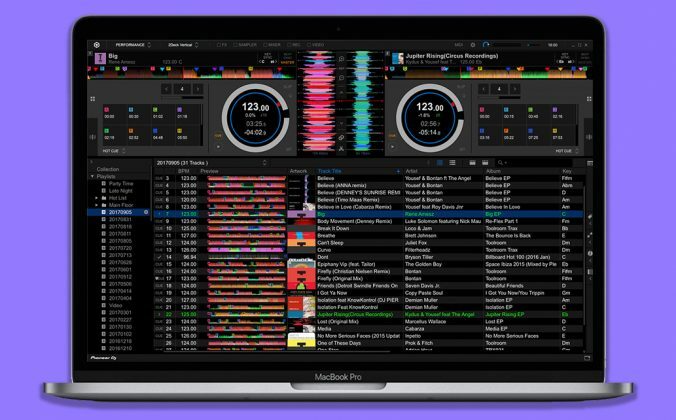 Does Serato dj intro allow mapping to change it? Also the jog wheels look kind of flat. Maybe not ideal for pitch bending. Second that on the master volume slide….I’ve got it on my Reloop RMX40 mixer. Every once in a while you just take the master volume down while touching the channel 4 fader or one of the other buttons around it. Still no channell gain.. huge mistake on the update. I agree 200% Luis. I too own a numark mixtrack pro, & one of my biggest complaints is the missing channel gains. My mixtrack Pro also Has had the crossfader go completely out on me like a week after the warranty expired!! 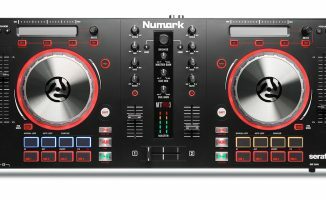 Numark has great products in its history but now they are lagging behind the competition here & with the mixtrack pro & version II. I’m lokking to upgrade immediately, and the dennon mc3000 is top on my list right now. Any other suggestions are well welcomed here!!! Just wondering, when you use traktor with the autogain feature (or have all your tracks “done” in something like Platinum) how much of an issue is the lack of gain knobs (mind you, I am all for gain knobs!) really, for the starting DJ that is targeted with this device? I looked at another picture and it has a shift button, perhaps you can suffer whatever function is currently on FX3 knob and remap it to the channel gain? If the 3000 is anything like the 6000 (I know it is a bit less cluttered :-)), I can’t think of offering a better suggestion. Here’s hoping this is USB class compliant like the first gen of Mixtrack Pro, you may see it in use with iOS devices as well. Those banks of pads would line up neatly with the 8 cues/loops on DJ Player! Worst thing about NMP is the build quality…. The jogwheels look smaller than the first edition, and I highly doubt whether the flatness of these things is an improvement. It also looks a little too much consumer-quality, with all the bright colours, especially the red on the jogwheel. Other than the drumpads, it doesn’t look like mich improvement, more like a renewing way for Numark to gain money from the consumermarket. We’ll let you know about the jogwheels when we’ve had a look at it at the show. No channels gains is a HUGE mistake! Apart from the pads I see absolutely no improvements here. The build quality looks exactly the same too. I don’t see too many people upgrading to this unit. Sorry, I just noticed it ships with Serato Intro. I guess that does change things a bit. Anyone can get Serato dj intro for free without buying this controller. So, having Serato dj intro ship with the mixtrack proII does not move me either!! I downloaded dj intro from Serato’s website for free and i use it occasionally with my mixtrack pro. 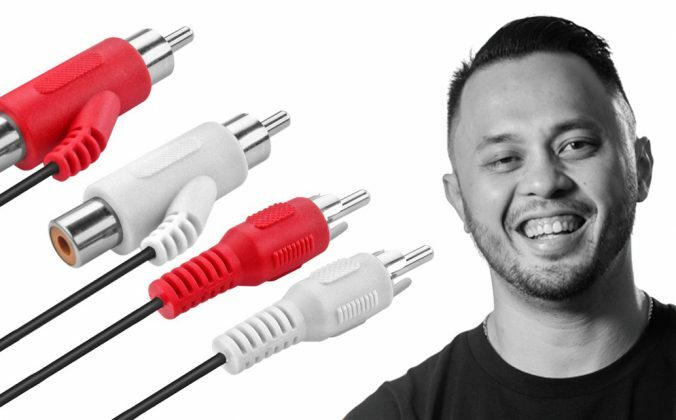 Yes, but you can’t use it unless you have a licensed Serato DJ Intro controller, which this is. I rather like the original layout of the original mixtrack/pro. As a mobile/wedding dj (primarily) I don’t scratch and only lightly use cue pointsand effects. Looks more like a toy like others have said. Stay original but maybe an aluminum chassis for an update instead of upgrade. Cheers from NYC. isnt it bad when the headphone jack is on the side? I noticed that as well and it will be an minor issue for the flight case folks to create a notch just for that. For me, frankly, it’s almost look same as old one. Why should I buy this one if the old one is cheaper and same standard. If I want to upgrade, better to go with Huge upgrade one. Poor Mixtrack…. When I first got started, I briefly considered the Mixtrack. Thank God it was out of stock. Truthfully, it looks rather cheap and I don’t like the layout. Even with the improvements, I just don’t see it at that price point. 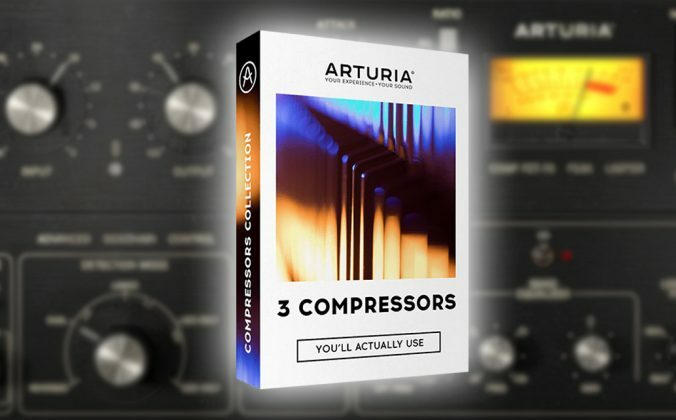 Honestly, when you get to that price, you may as well save a hundred dollars more over a month or two and go for an MC3000 or some sort of metal based, solid controller with more features. 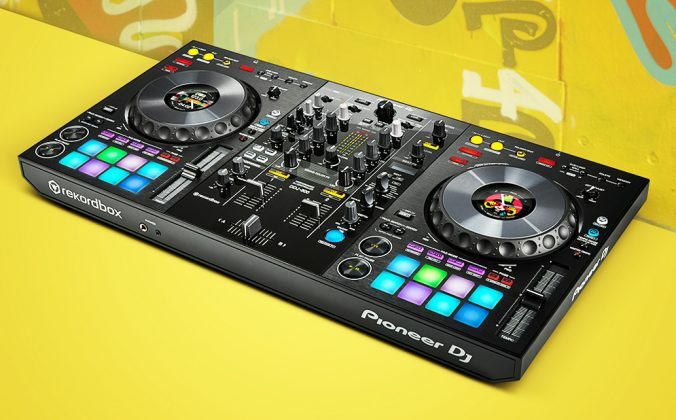 The Serato thing was a smart move, but I don’t think it is the right controller for it. If I already have a serato dj license and upgrade to this unit can I still use the mixtrack pro 2 with the license. I dont know how i feel about this controller. Yes the drum pads would be helpful, but it would appear that you get them at the expense of losing the loop controls,hotcue buttons, and fx trigger. I think i’ll just stick with my regular mixtrack pro and run a midifighter spectra along with it for the drums and other samples.